Precision optical elements, in many segments of today’s optics industry, include adding coatings to the lenses as a way to enhance their transmission or reflection of wavelengths. Anti-reflective (mirror), beam splitter and filter are the most common types of coatings that are applied to lenses for use in different technologies. Many industries currently rely on high power laser sources of lights and in those cases a standard coating can offer cost-efficient and easy to reproduce precision results but there are limits to the durability of standard coatings. These coatings break down more rapidly when subjected to intense irradiation. The guidelines for what a “high-powered optical system” varies based on both industry and manufacturer but many of users estimate a minimum intensity level as well as the laser-induced damage threshold (LIDT) as it relates to the application the lens will be utilized in. The most common failure of optical coatings comes from the “presence of absorption sites” within the coating’s interface. The failure of coating to perform leads to incorrectly transmitted wavelengths and that can skew hoped-for results. Particulate and organic residue that comes from cleaning and polishing lenses can lead to laser energy absorption and damage at the site. When lenses are coated it needs to be done through a series of specific protocols that are followed from initial production to substrate manufacturing to final packing and shipping of the lenses. When coating lenses for use in transmissive or refractive optics, high quality materials and processes must be adhered to in order to maximize transmission. The coating chamber for the lenses must be quality controlled to assure cleanliness and lack of any particulates in the area. Contaminants from the coating chamber or from the tools themselves can lead to lack of integrity in the optical coating. 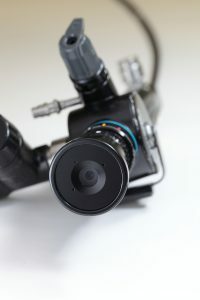 Any foreign materials that make their way onto the lens before the coating is applied can negatively impact the way in which the coating adheres and this could also impact the final results the lens captures and transmits. The type of material that is applied to the lens will be predicated on the end user application of the lens. UKA Optics works with customers to develop the lenses necessary for their unique needs whether in medical or manufacturing settings.